The leaning header of Pi5a. How best to solder a header on P5? #piday #raspberrypi @Raspberry_Pi « Adafruit Industries – Makers, hackers, artists, designers and engineers! Alex from from RasPi.TV spent some time considering how to make use of the unpopulated P5 territory on the RasPi — when an accident lead him to an elegant (if punny) solution to the problem. Read about how he considered his options and check out his solution! 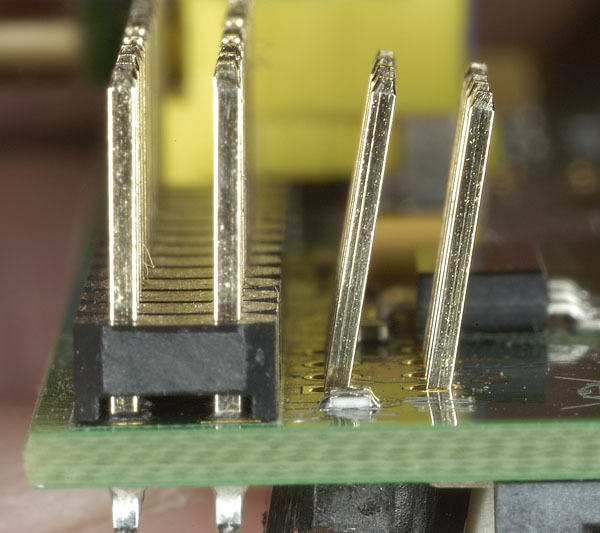 People seem very reticent about soldering headers to their Pis. Nobody else seems to be blogging or vlogging about it. D’you know what? I think it was a really magnificent oversight that the original Raspberry Pis shipped with the 26 pin GPIO header on. In case you didn’t know, the original plan was to leave them off, but they didn’t get deleted from the design before the factory quoted for manufacturing – and they’ve stayed on ever since. Without that happy accident, I don’t think I would have ‘gotten’ so heavily into interfacing. You see, I think I might have been a bit scared to solder a bunch of pins onto my Pi. I think a lot of people are reluctant to do that too, which may be why not much has been written about use of the P5 header on the Rev 2 boards….